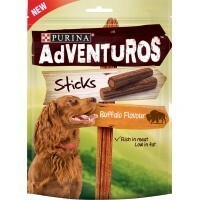 Purina Adventuros Sticks with Buffalo Flavour are a complementary pet food for adult dogs that are rich in meat, low in fat and irresistibly chewy. Rough ‘n’ ready on the outside with a soft, succulent filling, your four-legged explorer won’t be able to resist Purina Adventuros Sticks. Please adjust the meal accordingly. Fresh drinking water should always be available.